Social Commerce Tactical Guide - Tackling Social Media | ASTRALCOM - Content Strategy, Conversion Marketing and Customer Acquisition. 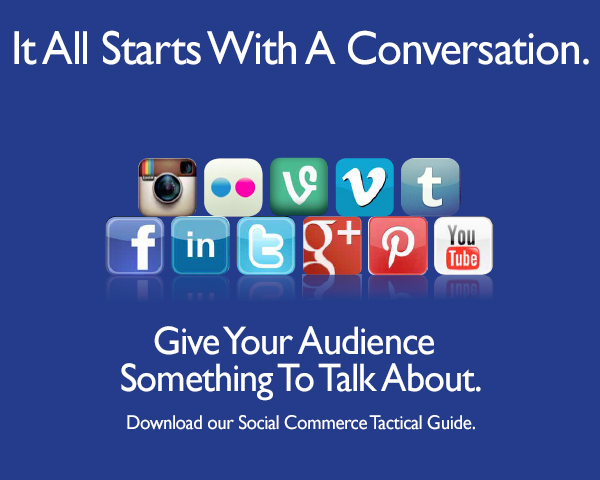 Tactical Guide – Social Media | ASTRALCOM – Content Strategy, Conversion Marketing and Customer Acquisition. Conversations lead to relationships and relationships lead to mutual goals and mutual goals lead to fulfillment. If you give your target audience something to talk about, then you’ve helped spark that conversation. Indeed, that very conversation could be the start of something viral. Social commerce is the result of making a connection with your audience. It’s the byproduct of inspiration and discovery. Think about it. You find something that inspires you and you start telling your friends about it. So, how is it accomplished? Download our Social Commerce Tactical Guide 2015 and discover the best ways for your brand to become part of the conversation – or to start one. Or, Contact us today and let’s get to know each other.